Going Through at the Bush Theatre. Photo: Ali Wright. Whether it’s art or journalism, there can’t be many tasks harder at the moment than getting Western audiences to truly empathise with the experience of people that leave their homes and undertake dangerous, frightening journeys in the hope of finding a better life in a strange land. Of course it’s a difficult task to imagine those circumstances, but I think we also wilfully block ourselves from doing so, because if we didn’t, the guilt we’d feel about our own privilege would be unbearable. This is a phenomenon that unites almost everyone in countries like the UK; the attitudes of those people who are hostile to migrants can seem reprehensible, but in a way they are more honest than those who believe in open borders – but only to a point. But Omar Elerian’s wonderful production of Going Through, a French play first staged in 2011, does this job splendidly. It does so by telling a story that entirely separates the journey made by its protagonist – Nour (Charmaine Wombwell), a teenage girl from an unnamed homeland – from the decision to go. This decision is made for Nour by the woman who raises her, Youmna (Nadia Nadarajah), and Nour’s unseen birth mother, who we are told is waiting for Nour in her new home country. The truth about the relationship between these three characters only becomes apparent at the end of the story when Nour reads a letter written by her mother and given to her by Youmna, who tells her only to open it when she has become a woman. It’s a tender and heartbreaking revelation that frames the whole story around the lengths a parent will go to for their child. The sacrifices made by Nour’s mother are incredible, but not so much that they won’t resonate with almost anyone, parent or not. The smart, efficient set design by Rajha Shakiry uses shifting panels of various sizes, which shift around like Tetris blocks and take on changing projected imagery – trees, watermelons, shipping containers – to continually introduce new environments. This does a great job of creating a sense of continual movement in the mid-section, when Nour is on her arduous journey. But it’s the use of sign language that really gives this production its own distinctive theatricality. Because the character of Youmna is deaf, the play is performed through a mixture of signing, Nour speaking directly, Wombwell’s recorded voice – which seems to at different points speak the minds of both characters – and writing that appears on the blocks of the set. The stage starts to feel like a living entity, communicating telepathically with the audience, while Nadarajah’s performance is always engagingly expressive. 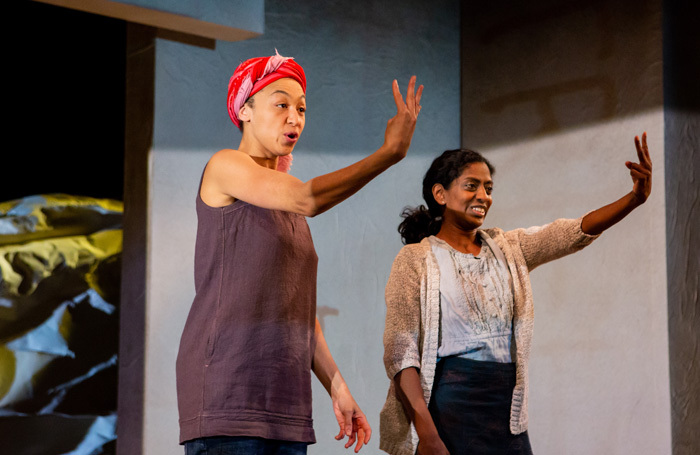 While most of the sign language is translated in either speech or text, some isn’t, meaning both hearing and deaf viewers miss out on bits of the script – an approach that feels inclusive, but that still acknowledges the barriers created by language. It’s only in the final section, when Nour arrives in her European destination country that Savasta’s play starts unashamedly to beat a political drum. Nour’s descriptions of her struggles with the immigration system of her new country might be didactic, but they quite reasonably hammer home what a disgrace our procedures are, and how shameful our political discourse around immigration is. Mass migration is probably going to be the story that dominates human life in the twenty-first century. For everyone’s sake – not just the Youmnas and Nours of the world – we need some better ideas. Going Through is on at the Bush Theatre till 27th April. More info here.